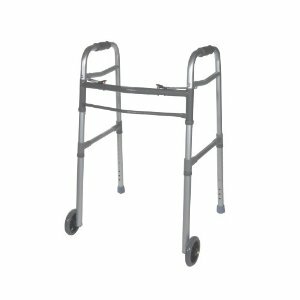 Walkers with Wheels or Walkers without Wheels? Walkers without wheels are the typical walkers that you see being lifted and moved by users as they walk. The main difference between a regular walker and a wheeled walker is the way you move and control the walker. You LIFT a regular walker while you PUSH a wheeled walker. For some, the wheeled walker is easier to use, but for others, the regular walker is easier because they have more control over a regular walker. For some users, one disadvantage of wheeled walkers are the wheels. You can be carried away by the wheels if you are walking on a sloped-down surface. Wheeled walkers are usually called Rollators or Rolling Walkers. Some wheeled walkers have 3 wheels; the others have 4. The 4-wheeled walker offers you a higher level of stability, support and balance, but the 3-wheeled walker offers you more flexibility. In smaller spaces, you can maneuver more easily the 3-wheeled walker. 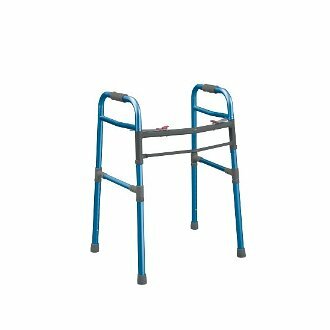 These walkers give you combined benefits: the control of the regular walker and the ease of the wheeled walker. 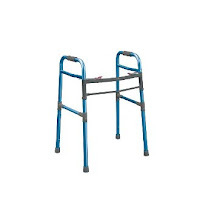 You can push the walker while walking, without the need to lift the walker, and then use all the four legs of your walker for full support when you stop.